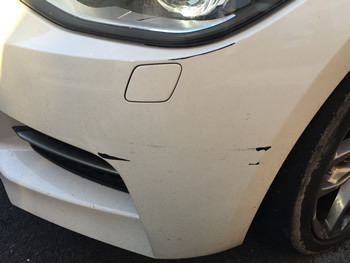 Bumper scratches caused by a collision with the cars bumper can be repaired by our mobile smart repair service which comes to your home or place of work in order to carry out the mobile bumper scratch repairs in Hertfordshire, Essex and London. 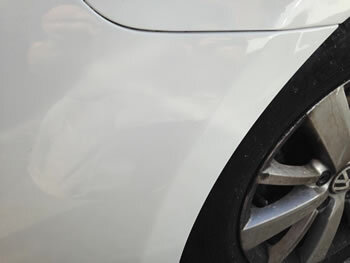 Repair time for a standard bumper scratch or bumper scratches which are located on or around the corner of a bumper would generally take between 2 - 3 hours in total to finish. 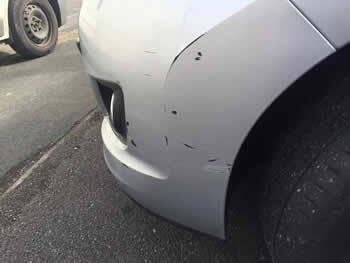 99% of all bumper scratch damage can be repaired by our mobile scratch repair teams, if you are in doubt about the severity of yours and are wondering whether it can be fixed or not then send us an email with a photo of the bumper scratch and we will get back to you in 24 hours, or fill in our Car Body Repair Quote form. This slight scuff damage is on the front offside corner. 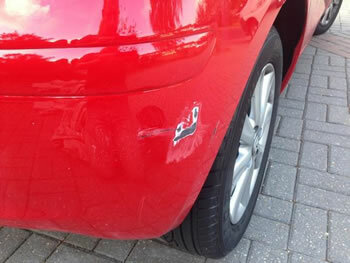 The car was pretty new and in mint condition, it was only the damaged paintwork that let the cars exterior down. Being a darker grey it showed up the light undercoat and could be clearly seen even from a distance. It was a straightforward fix and a simple job compared to some of the others I’ve experienced over the years. The customer was based in Bishops Stortford; the job was carried out outside the customer’s home in Bishops Stortford. In total from start to finish it took slightly under 2 hours to complete. The finish looked great as if it was never there in the first place. 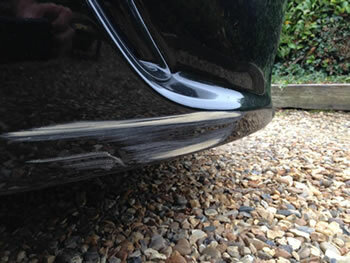 This customer had scuffed the front of his Mercedes SLK on a wall whilst trying to park. 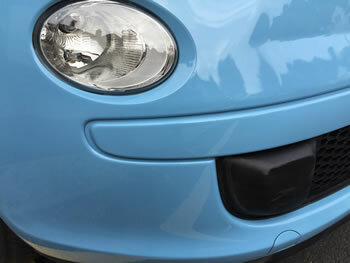 As you can see the bumper plastic has been scuffed deep on the corner taking paint and pieces of plastic off the panel. The customer had originally gone to a local Mercedes repair centre for a quote, they had wanted to remove and replace the entire panel. As you can imagine the quote for such a fix was well in excess or £1000. 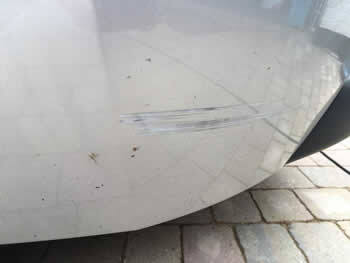 Luckily the customer had decided to look elsewhere for a competitive quote on the Car Bumper Repair. We quoted over 80% cheaper than the Mercedes garage. The job took slightly under 2 hours to fix and looked like new and no need to replace the bumper. 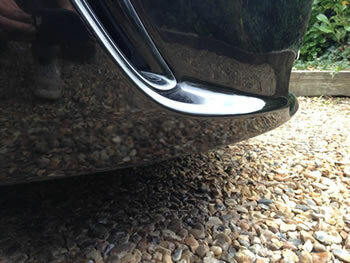 This slight graze on the lower bumper/wheel arch trim was caused by a low trolley hitting the car at a DIY store in the Felsted area of Essex. 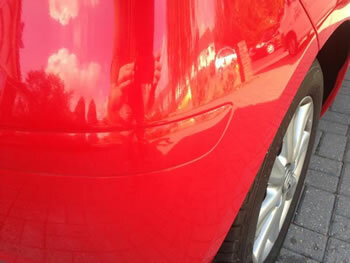 Body shops were quoting to replace the trim section with costs coming in at over £300. We fixed the graze on the trim in 2 hours and didn’t replace any parts, all carried out at the customer’s home address. 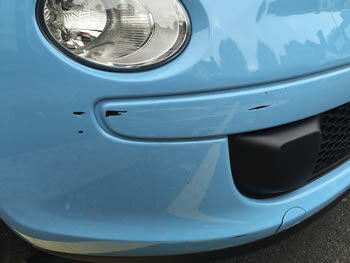 This Fiat 500 in Sky Blue was driven too close to a post in a car park. 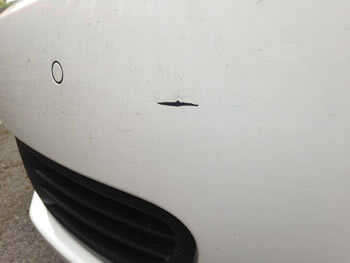 The post grazed the corner of the panel leaving behind deep gouges in the vehicles paintwork. The job was carried out at the customer’s home address in Hitchin Hertfordshire and took slightly over 2 hours to complete. Once the job was done the panel looked like new. 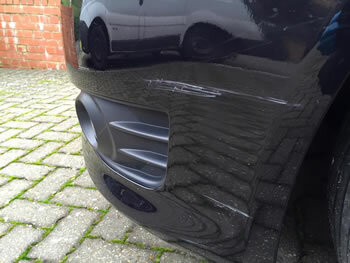 The paint damage was on the rear panel of a BMW in Welwyn Garden City in Hertfordshire. 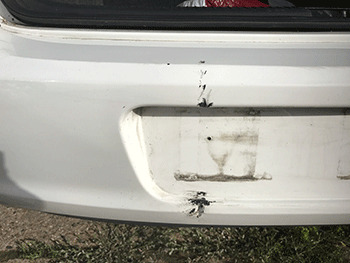 The customer found my details on the Internet and sent over a few photos of the damaged bumper. A price was agreed and the work carried out within a week. 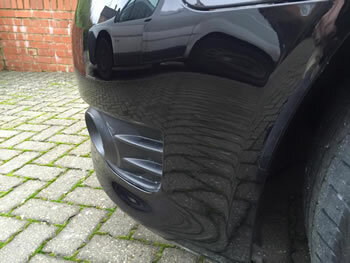 The bumper scratch wasn’t too hard to repair and took just under 2 hours to complete t the customer’s home address in Welwyn Garden City. The hardest part of this type of repair was the colour. White is one of the hardest colours to paint outside due to the fact that it shows up any imperfection in the paintwork. So every layer and process had to be checked and double checked to make sure no small bits of debris or dust got into the painting process. The job took 2 hours to complete and was carried out at the customer’s home address in Woodford in east London. 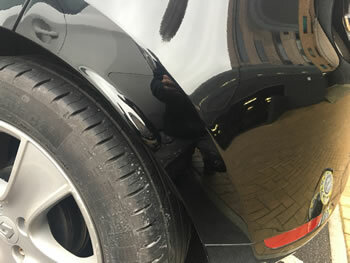 This customer had his Audi Q2 scuffed while it was parked. 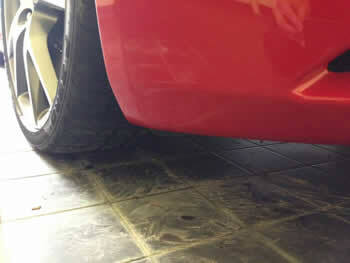 The damage is located over the front corner section of the bumper and slightly over the wheel arch trim. The job was carried out at the customers home address in Stevenage Hertfordshire in under 2 hours. 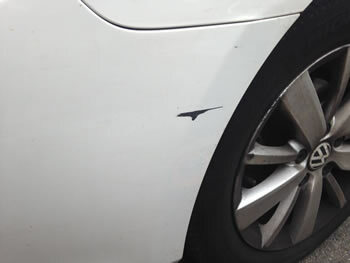 A low lying post caused this scratch on the near side bumper corner on a brand new Peugeot, that the customer scuffed while trying to park. The paint and undercoat has been removed and you can see the bare plastic. The job was carried out in Royston in Hertfordshire and took just under 2 hours to complete. This customer had parked outside of his work and the shop next doors sign had fallen over onto the corner section of the car. The Sharpe edges of the sign had taken deep gouges out of the paintwork and around the lower trim area. We repaired the damage and repainted the prepped area putting it back to showroom condition. The job took just under 2 hours to complete and looks like it had never been damaged in the first place. This Toyota was located in the busy town of Enfield in North London. 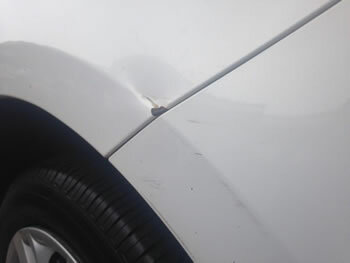 This customer had damaged the paintwork on the rear trim on her car. The damage was only slightly on the surface and thankfully for her not too deep. The entire job was over and done with in under 2 hours and was completed at the customers home address. Another driver had hit this Volkswagen. 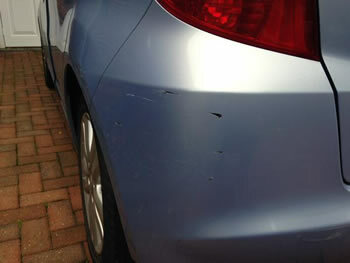 The damage as you can see in the photos below is based above and below where the number plate sits on the rear. The plastic panel has been deformed and the area around it has been badly gouged. The job was carried out at the customers address in Brentwood Essex and completed within 4 hours. As you can see from the photos the damage is located on the lower section of the front panel, it stretches around the corner to the light fitting. The job was completed outside the customer’s place of work in Stansted Essex and completed within 2 hours. This repair was carried out in Barnet North London. The customer had caught it while reversing into a tight spot. The paint damage was not too bad it’s the slight warping of the plastic that caused us a few issues. 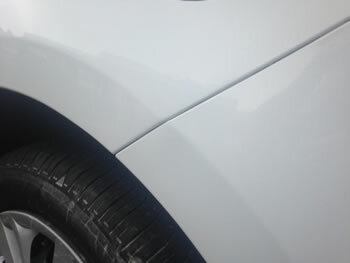 We had to reshape the deformed plastic edge before we could even attempt to repair the paintwork. The job took just over a couple of hours to complete at the customers house in Barnet and looks like new. This customers Lexus had been knocked while parked in a shopping centre. The Damage as you can see is located on the rear corner of the cars bumper. It’s not too deep and was easy enough to blend in due to it being right on the corner of the panel. We carried out the job at the customer’s home address and was all done and dusted within 2 hours. 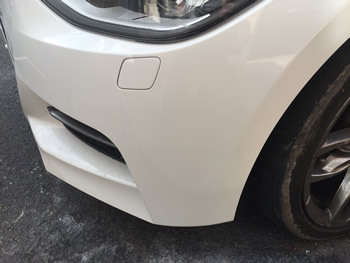 This scuff on the front corner section of this customer’s car was caused by his wife catching a low obstacle while moving down a tight alley in Sawbridgeworth Hertfordshire. The damage is only slight as can be seen by the photos below and only required a small amount of plastic padding in order to reshape the panel. The hardest bit of the job was the painting, the paint was so transparent that I had to put on at least 5 coats in order to cover the under coat. The job was completed within 2 hours and looks like it was never there. 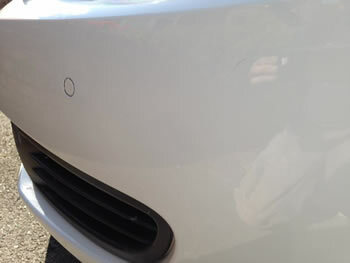 This scratch was caused by getting too close to a low bollard in a supermarkets car park. The scratch as you can see is on the lower front off side bumper corner. This customer was based in Loughton Essex; we carried out the repair outside the customer’s house and in less than 2 hours to boot. It’s not only the run of the mill type of car we repair but every now and again we have to fix high-end sports cars as well. This Ferrari F149 had a paint scuff on the lower front bumper corner. Due to its low profile this is a common area on these types of cars that take the brunt of any low impact collision. 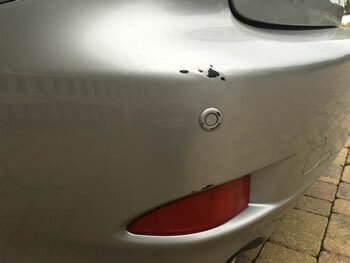 The customer already had an over inflated quote to fix the paint scratch from Ferrari and was not prepared to pay over £1000 for a bumper scratch. 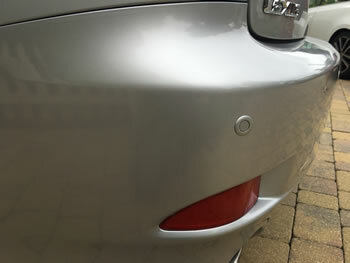 We fixed the paint damage for under £150 and he was over the moon with the result and the price. Slight scratching around the near side front corner of the bumper and around the wheel arch section. The hardest part of this job was blending in of the silver metalic paint, but with over 12 years experience was not an issue. 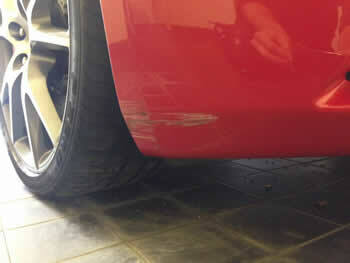 This customer had been quoted over £400 by a local body shop. We fixed the damage on his car for £120. 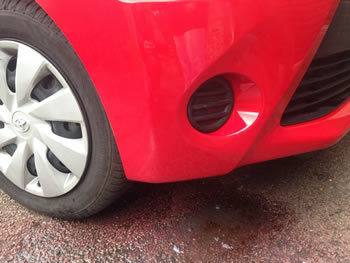 This customer had multiple scuffs on his BMW in Leytonstone East London. Where his car is white the scuffs and scratches really stand out. The damage in the photo below took around 2 hours to complete and looked like new once finished. This slight scratch was probabily caused by a low protruding branch down the tiny country roads that surround the Stanstead Abbotts area in Ware. It only took slightly under the 2 hour mark to fix the damage. The customer was very pleased with the result. 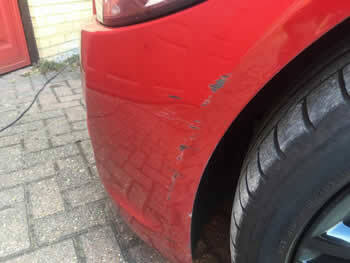 This little scrape was caused by another driver as he was moving out of a tight space. The damage is not too bad and just required a small amount of filler skimed over then a local respray of the damaged area. The job took just under 2 hours and looked great. This car was going back to the lease company and the customer did not want to get fleeced like they did last time when they returned a car. So he read reviews of the service we offer and took us up on our free quote service. He decided to go ahead with the job. 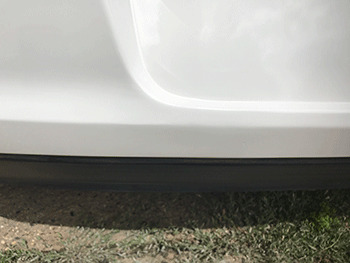 As you can see there are two separate scuffs on the front bumper, both are relatively small and took just under 2 hours to finish. The car when back to the hire firm and they were none the wiser, which saved our customer Hundreds of pounds. The damage wasnt the tricky part of this job but the paintwork was. The red colour is very thin and needed at least 4 coats to cover all the priming work carried out before. It didt help that the weather got worse while the paint was drying, but we managed. This Knock on the front corner panel was caused by the driver slightly touching a fence post just out side where they work. The damage was only light and took a couple of ours to fix. This slight knock on the rear corner was caused by a runaway trolley at a well known supermarket. 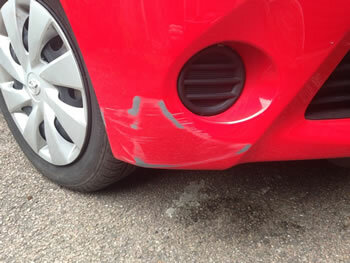 The trolley slid down the corner section of this customers bumper at pace and grazed the paintwork off as a result. As you can see the damage is quite light and took no longer than a couple of hours to fix. As you can see the lower section of this panels is damaged, caused by glancing a wall while trying to park. Its only superfishal but did require some filling. The job took just under 2 hours. 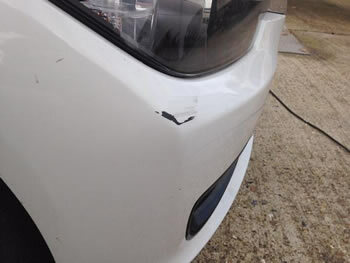 The damage shown in this photo is a dent on the lower wing and a slight graze on the bumper corner of a Mazda 2 in Harpenden Hertfordshire. The main problem with this job was the colour and not the dented wing section. 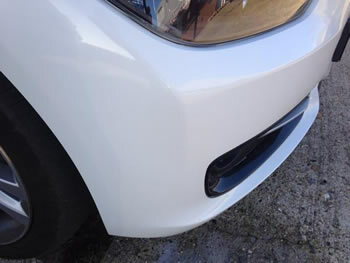 It's always difficult to repaint a white car for if there is even the tiniest piece of dust or dirt that gets blown into the paintwork when spraying will stand out like a sore thumb. 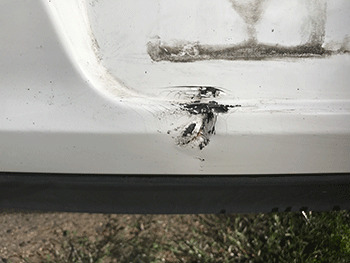 The dent due to its location did needed to be filled. Job took 3 hours to complete. The damage shown in the photo below was caused by slightly touching a low wall out side the customers work place. The scratches are very deep and were in need of filling. The repair took us just under 2 hours to complete. This customer got our number through a recommendation from a neighbour who lived a few doors down. This damage is on the off side corner and is quite deep. The customer was local to us in Hertford Hertfordshire. The job was carried out on a day when the rain couldnt decide whether it wanted to rain or not. The job took a little longer due to this but looked as good as new once completed. 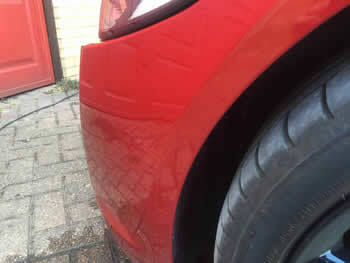 This customer had multiple repairs on his red VW Polo. 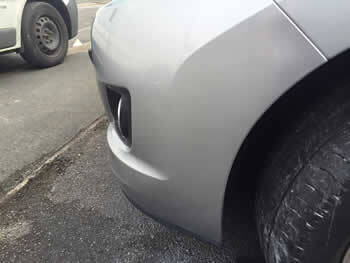 We got there for 8am and had 4 areas of damage to fix, the scuff on the bumper trim shown below was one of them. The damage was caused by slightly touching his wall in the garage. The only problem with red is that you need multiple coats of paint to cover it so it took a little longer than usual to complete the job. As you can see the damage has been completely fix. To carry out all 3 bumper corner repairs took over 3 hours. This little knock was a result of slightly touching a wall near a shopping centre in Harlow in Essex. The customer needed the problem fixed within 24 hours. Where we are a local service to Harlow we were able to fit her in at the end of the day so her partner would not see the damage on his return from work. Naughty Girl! This slight knock on the rear section of this customers car was a result of reversing into a low lying post. As you can see its not just the paint that's affected, the impact also scraped out a good deal of plastic too. The job in total took around 2 hours to finish, and the results speak for themselves. This job was based in Cheshunt Hertfordshire, nice and local. This customer was having her front of her house decorated when the tradesmen that were carrying out the work parked there car a little to close to hers. The result was that the tradesmen's van slightly knocked into the front panel of her car leaving a light graze on the corner section. 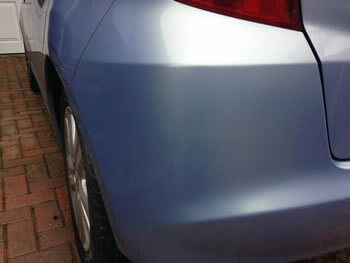 The damage was not too severe and was completely fixed within 2 hours, the only difficulty was the colour blend. the results speak for themselves with a near floorless finish. 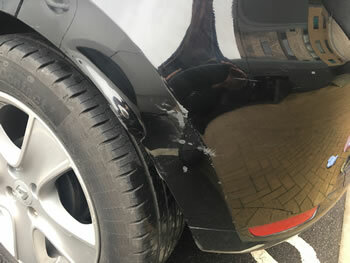 The damage on the rear corner section on this white Audi in Bishops Stortford in Essex was caused by getting too close to a low wall while parking. As you can see the lacquer, paint and some plastic has been removed as a result of the impact especially on the lower section. 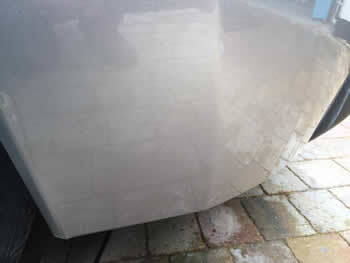 To correct this we had to use filler to skim in the deeper scratches and to reshape the effected area. The day we carried this out was gloomy dull and drizzly therefore the repair time was extended as a result. It took just over two hours in total and looks great. These set of deep scratches on the rear corner were a result of getting too close to a brick wall while trying to park. Good job the panel is plastic for that sort of an impact on a metal part would almost certainly require a replacement. The job was carried out in Brentwood Essex by our mobile service on one of the few dry days we have had this winter. It only took 2 hours and looks good as new. The customer had originally had the car booked in at a local body shop and was prepared to pay £400, good job he contacted us before he took the car in, we only charged £95. As you can see the damage is over 2 panels the rear bumper corner and the rear wing. Even though the damage is slight on the wing there is nowhere to blend the paint in, so we had to blend the paint up the wing to lose the edge. The damage on this Merc is on the front off side area around the wheel arch. It was caused by a light collision with a low brick wall in a supermarket. The customer found our details on line and booked us in to carry out the work. The whole job took us around 2 hours and looked like a new panel. The customer was pleased with the result. Jobs like the one above can take as little as an hour or as long as 3 hours, it all depends on how bad the damage is. This job only require a small amount of plastic padding and with a warm dry day this was completed within time. This customer had left his car outside his house overnight and in the morning found that someone had gone into the rear of his vehicle. There was no note and no one had seed the accident. He did not want to go through his insurance in case his premiums were increase so gave us a call to get it fixed. The damage is located right on the corner section of the rear bumper, which is a good place if any to be hit for the blending in of the paintwork is much easier. After a few problems with the weather were corrected the job finally was completed within an hour and a half. The only tricky part of this repair was trying to keep all small bits of dust and debris from sticking to the paint while being cured. 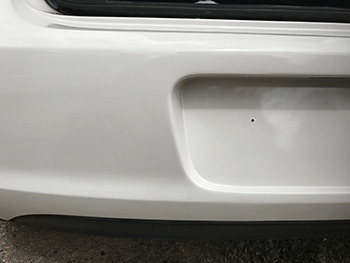 Because its white any thing other than white dust would show up on the completed repair. Luckily he had not completely ruined his car, the sprayble are was larger than it should have been but completely repairable. The only area we had difficulty with was the dented lower section on the contour line.